With each new project, it is necessary to design some lab assays for screening the type of performance that a new additive or product must exhibit if it might ultimately be used commercially to address a problem. Below are a couple of examples of this type of assessment. The first, the minifurrow assay, has been used to determine if an additive to "irrigation water" in the lab can stabilize soil so that it does not erode under conditions of fluid flow. The second example shows the results of a protocol for assessing the utility of a novel chemical treatment for clarifying oily water produced during recovery of oil from deep wells. 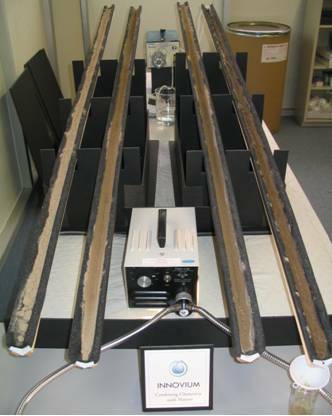 In the case of the soil-retention agent, we developed a minifurrow assay to mimic erosion during furrow irrigation. Actually, the minifurrow conditions were a lot more challenging than are typically encountered on an actual field. For example, the minifurrows were set at a 10% slope. In the field, slopes are usually less than 2%. In addition, the rates of flow down the minifurrows often were set high enough that water flowed over and through the sample of soil that we placed in the furrow, and along the bed of the rill as well. Naturally, something like this wouldn't occur in the field. We learned that if we could stabilize the soil well in the minifurrow assay, the product would perform well on the farm. Left: Minifurrow outflow with SoilSentry. Right: Control (no treatment). During product R&D, this type of effort continues on an iterative basis, often for an extended period of time. For example, literally more than one thousand experiments at this small scale were run during development of SoilSentry. At present, SoilSentry is being applied on 1000's of acres in the Imperial Valley of California, with a target market for the overall product launch being the millions of available acres currently in irrigation farming in the western USA. However, there was still quite a distance to go from the positive minifurrow work in the lab to the commercial product. The next steps involved scaling-up of synthesis of a product and more realistic performance testing. 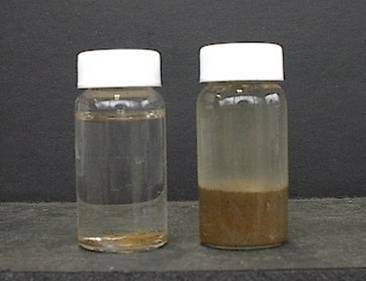 The vial on the left contained untreated produced water. 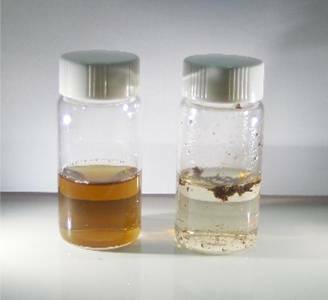 The vial on the right was treated with a clarifying agent that is derived from natural feedstock. If a treatment looks promising in the vial assays, the next step is to scale up a little and run assessments in jars. 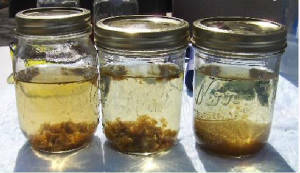 Again, shown here, are some successful treatments in which the water is clarified and the oily solids form into a separate phase. As shown below, it is possible to arrange the treatments so that the oily solids settle out (jars on the left). Alternatively, they can be made to float (jars on the right). Depending on the preferences of the customer and the types of capital equipment that make up the production line, either of these options can be selected for specific points in the line. Making the oily solids sink or float actually is not that simple. 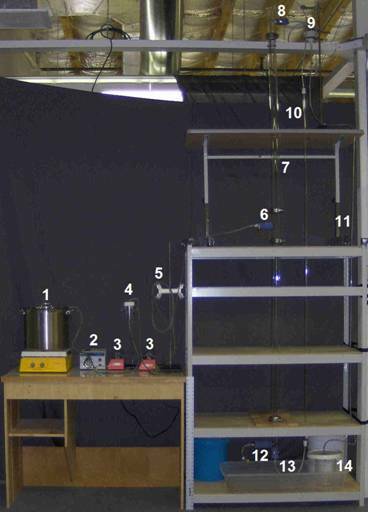 To study these phenomena in a continuous-flow simulator that allows direct visual inspection of the behavior of the produced water and the oily solids, we designed the apparatus shown here. Through studies like this, we were able to identify some chemical packages, treatment protocols, and equipment (patents pending) that can readily be implemented in traditional SAGD facilities as a "plug and play" module. This allows the operating company to quickly and continuously clarify the oily water, and to separate the solid and aqueous phases in real time with very high efficiency.